Boston Materials offers composite component manufacturers Carbon Supercomposite™, a drastically toughened carbon fiber composite with enhanced Z-axis properties that exhibits signs of plastic deformation before fracture. Boston Materials believes that a material-level solution can enable and accelerate the development of next-generation transportation and energy technologies. By leveraging proven textile manufacturing methods and a high-profile research breakthrough, Boston Materials designed Carbon Supercomposite, a 3D-reinforced carbon fiber prepreg. Boston Materials manufactures Carbon Supercomposite to immediately serve the need for tougher, safer and more versatile composite materials for component manufacturers in commercial and industrial sectors, and hopefully aerospace in the future. This material-level solution is made by applying a coating of Z-axis oriented milled carbon fibers to standard carbon fiber fabrics, forming a 3D reinforced prepreg with dense interlaminar reinforcement. Boston Materials supplies Carbon Supercomposite™ as prepregs and dry fabrics that plug-and-play with virtually all carbon fiber composite manufacturing methods. Boston Materials was spun-out of Northeastern University in 2016 by Anvesh Gurijala, Michael Segal, and Dr. Randall Erb. The founding team originally worked together on an undergrad senior capstone project, during which Boston Materials' core technology was invented. The company was bootstrapped for almost two years and in 2018, Boston Materials received a Phase I SBIR from the National Science Foundation. With this grant, Boston Materials developed the first iteration of a roll-to-roll production process for its Carbon Supercomposite materials. Recently, Boston Materials closed a $1.75M funding round with Clean Energy Ventures and SABIC Ventures. With this funding, the company hired Kedar Murthy, the Chief Commercial Officer, and opened a new pilot production facility in Bedford, MA. Boston Materials currently has seven employees and will be launching its first Carbon Supercomposite product early this summer. Anvesh Gurjiala is the CEO and one of the founders of Boston Materials. He leads the development of Carbon Supercomposite products to best fit customer needs and build strategic relationships with established companies and investors in the composites industry. Anvesh's capstone project during his undergrad at Northeastern University four years ago helped build the foundation of Boston Materials' technology. Over the past four years, the most important lesson that Anvesh learned is that developing personal relationships with customers, partners, vendors, investors, and teammates is the best way to build a strong and sustainable business. 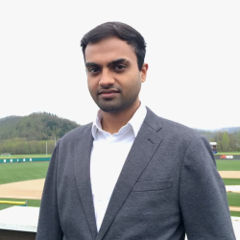 Outside of Boston Materials, Anvesh is an avid Formula One fan, which stems his passion for lightweight, high-performance materials and vehicles. He hopes one day he can build a manual transmission performance hybrid car because it would be blast to drive. "Chalcogenide glasses enable ultra-thin lenses with unique functionalities"
The mid-infrared is a frequency band strategically important for numerous biomedical, military, and industrial applications. Further development of mid-IR devices is hindered by the lack of inexpensive and efficient basic optical elements, such as lenses, wave plates, filters, etc. Furthermore, the available components are typically bulky and passive. Our research addresses these challenges by leveraging novel low-loss, high-index chalcogenide glasses and their sub-wavelength patterning to achieve ultra-thin, high-efficiency, and multi-functional mid-IR components. As a proof-of-principle, we demonstrated a bifocal metalens with a switchable focus and a single-layer planar metalens with a record 170 degree field of view. We believe that our findings will enable new range of compact, multi-functional spectroscopic and thermal imaging devices. A physicist from Moscow Institute of Physics & Technology and PhD degree in Electrical Engineering from Purdue University, now in MIT Materials Science & Engineering department, Mikhail Shalaginov continues to explore extreme light-matter interactions at nanoscale. His doctoral research was devoted to pioneering the direction of quantum nanophotonics with color centers in diamond. Mikhail’s major research achievements include the first demonstration of single-photon emission enhancement with metamaterials, development of a single-photon source with the highest emission intensity at room temperature, as well as implementation of an ultra-compact on-chip integrated spin-plasmon-microwave interface for nanoscale sensing. For his PhD research achievements, Mikhail received the 2017 College of Engineering Outstanding Graduate Student Research Award, a top honor annually given to 2 graduate students (out of 700+) at the School of Electrical and Computer Engineering at Purdue University. Aiming to expand his knowledge and expertise in the field of novel optical materials and integrated photonic devices, Dr. Shalaginov is pursuing his postdoctoral training at MIT. His latest research is centered on the development of multi-functional phase-change metasurface devices for the applications in the mid-infrared region. He succeeded in demonstrating a bifocal, switchable, all dielectric metalens and a single-layer, planar, high-efficiency metalens with a record-high 170 degree field of view. His recent works on phase-change reconfigurable metasurfaces also received multiple Best Presentation awards at several research conferences at MIT. ASM International fosters the understanding and application of metals and other engineered materials and their research, design, reliable manufacture, use, and economic and social benefits. To join ASM International, click here.